Missouri state officials are under pressure to respond to a report that shows disparities between blacks and whites in traffic stops are the worst they've been since the state began collecting data 15 years ago. According to the annual report released by the Attorney General’s office on Monday, black motorists in 2014 were 75 percent more likely to be pulled over by police officers than white motorists. A coalition of social justice groups is calling on Attorney General Koster and other state officials to take meaningful steps to address the issue. “This is data. This was not testimony; this was not video of an experience. These are just cold hard numbers,” said Montague Simmons, executive director for the Organization for Black Struggle, at a press conference on Tuesday. Simmons criticized Koster and Governor Jay Nixon for allowing the problem to persist. The coalition is calling on Attorney General Koster to convene a policing summit to address racial profiling before the end of 2015. Executive Director for Empower Missouri Jeanette Mott Oxford said the summit would look at ways to promote impartial policing and improving police and community relations. A spokeswoman for Koster said the Attorney General’s office has scheduled to meet with Mott Oxford to discuss the coalition’s ideas and convening a statewide summit on policing. The percentage of African-American motorists in Missouri being pulled over by police is the highest it’s ever been since the state began collecting data to guard against racial profiling. The annual "Missouri Vehicles Stops" report, issued by the Missouri attorney general's office, said that during 2014 black motorists were 75 percent more likely to be pulled over by law enforcement officers than white motorists. That’s a nine percentage point jump compared to 2013, when black motorists were 66 percent more likely than whites to be pulled over by cops. Attorney General Chris Koster calls the pattern "striking." "Just 14 years earlier, in 2000, the difference was only 31 percent," Koster said in the report. 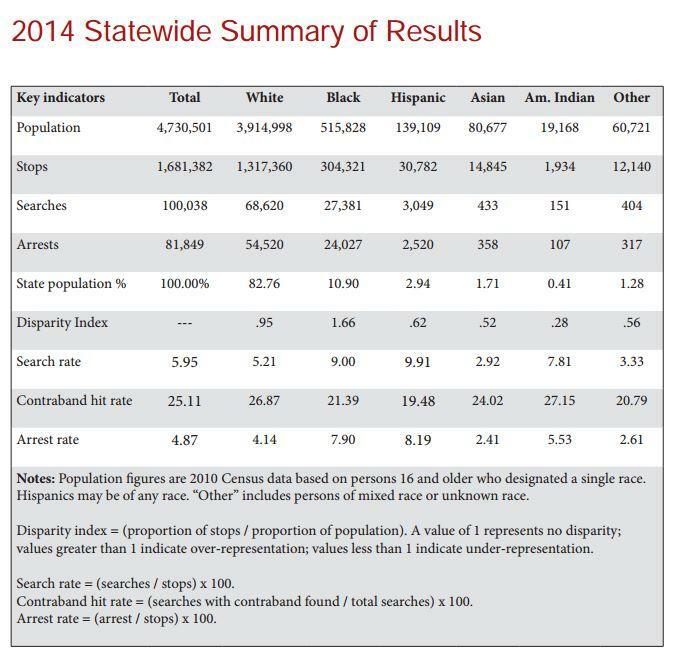 This year's report also found that the disparity index was below average for Hispanics, Asians and motorists of other races. However, Hispanic motorists were more likely than blacks to be searched and arrested. The numbers in the report are based on the percentage of drivers aged 16 or older pulled over in traffic stops in Missouri. Koster states in the report that there is no single explanation for the disparities, but he also says the findings "continue a disturbing trend for African-American drivers in Missouri." Eleven law enforcement agencies did not submit their traffic stop data to the attorney general's office, which Koster says is required by state law. The Wellston Police Department and the St. Louis Park Rangers are in this area. Other police departments are Edgerton, Lilbourn, Morley, Deepwater, Naylor, Camden, Hurley, New Melle and the BNSF Railway Police. The full 2014 report can be viewed here. Copyright 2015 KWMU-FM. To see more, visit http://www.stlpublicradio.org. In the race for Missouri Attorney General, the two front runners, Democratic incumbent Chris Koster and Republican Ed Martin, agree on few issues.